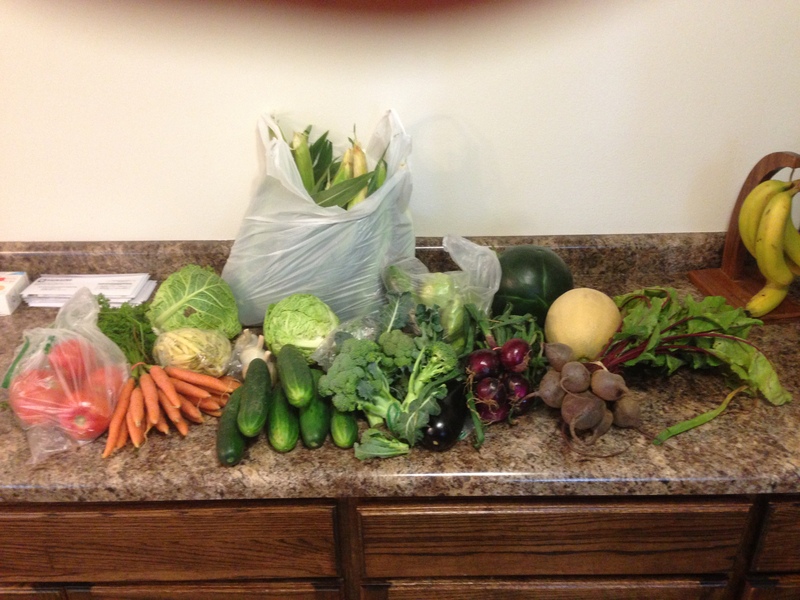 CSA Week #10 – Nutrition.Health.Life. We are over half way through our CSA – where has the summer gone?!? Last week the food prep was difficult for J because Tuesday night there was a huge storm that damaged our house. Last weekend I wrapped things up and now he has plenty of food for the week. This delayed food prep might become the norm, so the previous week’s box will become dinner for next week instead of the current week. Everything stayed just fine – I guess I am too used to how fast things go bad when you buy them in the store but forget that the CSA is picked the day I pick it up, not days/weeks before. Slice and steam for 5 minutes; place 2 cup portions in a freezer bag and freeze for the winter. roasted eggplant lasagna made in the crockpot using the vegetables we have here (shredded summer squash, corn, onion, and broccoli). Substitute roasted eggplant for noodles (salt to remove moisture for about 15 minutes and then roast at 425F x 25 minutes). Preheat oven to 350F. Rinse corn and roast for 35 minutes. After corn is done, roast beet chips (or beets whole if you are making one of the other recipes). Salt eggplant around the same tme you add the beet chips. After beets are done, roast eggplant. Assemble cabbage rolls and cook in slow cooker overnight. Slice green beans and steam in a microwave safe glass bowl for 5 minutes. Let cool and bag for freezing. This entry was posted in Nutrition and tagged CSA, vegetables. Bookmark the permalink. I’m going to have to try some of your tips and recipes…I can’t wait for the farmer’s market to be open again!